It’s Halloween, so that means my “Flower Bomber” costume from four years ago has found renewed interest. This year’s excitement has been an interview with PBS NewsHour as well as being declared “brilliant” by Buzzfeed (take that for what you will).The reason I’m finally writing something about the costume is that it’s clear that it has become “a thing” and may it be the thing that I am most known for around the world, so I should probably give it some context. It’s been sitting in my Flickr feed for four years without much explanation. Another reason is that my image was also used by Buzzfeed without attributing the source. * The excuse is often “well, you know how the internet is.” The virality of photos and the ease of losing the attribution across the vast Tumblr sea is a problem, but when the Google search is as simple as “Banksy costume” you have to wonder how much effort-to-dollar ratio sites like Buzzfeed are expending. This should hopefully ease the burden of the next wannabe listicle outlet (I’m looking at you, TheChive). PBS NewsHour and, more specifically, Victoria Fleischer were a classy outlet. They contacted me about the photo, asked me some questions and let me know when the article was posted. Good folks. They left 80% of the interview on the cutting room floor, so I’m just going to post the rest of it here. 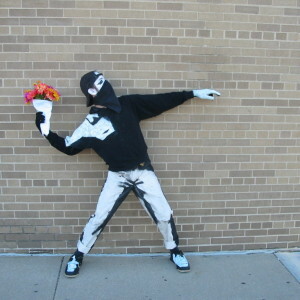 1) How did you decide to dress up as Banksy’s Molotov man? 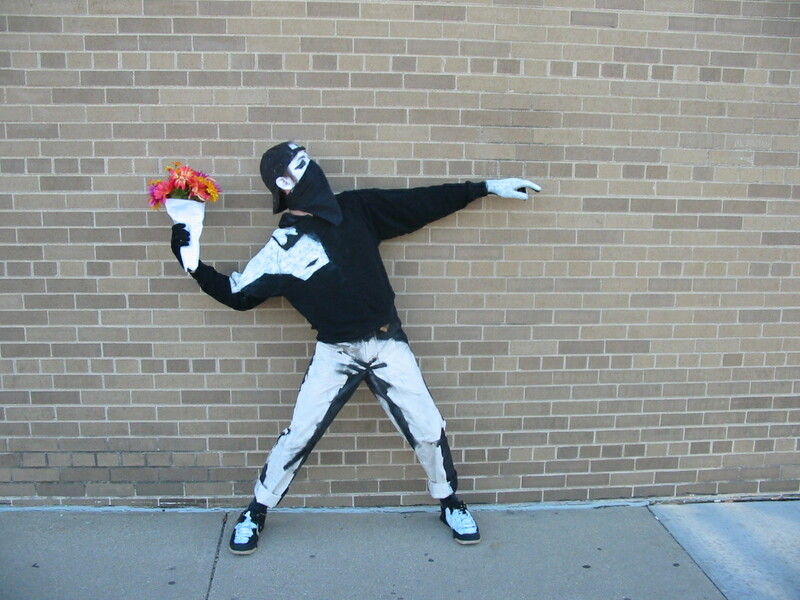 What do you see in Banky’s Molotov man that made you want to bring it to life? Recently Banksy was in New York City selling original, signed art for $60 per canvas, but nobody believed it was him and so he only sold a few pieces. 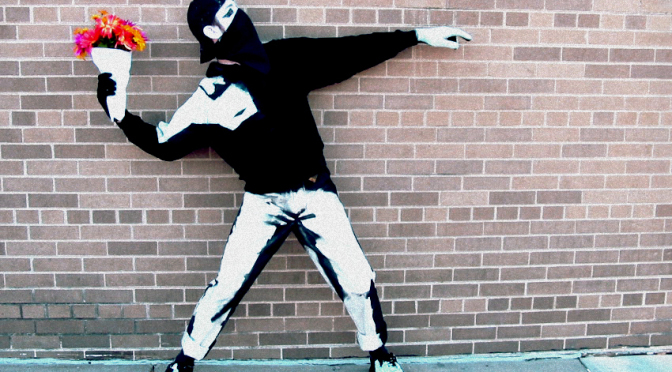 I briefly considered doing another Banksy costume this year which would have just been me with a table of his art with my signature, but somebody already beat me to it. 2) Was it difficult to create the costume? It wasn’t too difficult to create the costume. I put on the clothes and loosely marked where the shadows and highlights needed to be. I probably spent only a few hours putting it together. I kind of wish I spent more time on it now, because it has sort of become my 15 minutes of fame (if you want to go that far) and I have seen other people do it better since I first did it. It just goes to show if you’re going to spend time doing something, you gotta do it right. 3) How long did you keep that pose for throughout halloween? 4) How was the respond to your costume? Did people recognize it? Not a lot of people came up to me while I was in costume, but people definitely loved the idea when they saw it on the internet. It seems to come back every year, so I was definitely banking on the long game. 5) What is the significance of the art work or the artist to you? Banksy was the first street artist to make me recognize that there can often be more to graffiti than a simple scribble or a defacing of property. There can be repeating themes and deeper social analysis, from small observations to grand ideas. I don’t know if it’s “real art” or if it’s worth zero or $1,000,000 but Banksy does have a knack for get people thinking about their surroundings. And that was that. If you’d like to use the image for an article of your own, feel free. The photo is available for use through the Creative Commons Generic 2.0 license. All you gotta do is link back to this blog (preferred) or the Flickr image. And a big thanks to Nick Barth, who took the photo. I couldn’t have done it without him…at least until another capable stranger walked by to indulge me. *Buzzfeed later corrected their error and all was right with the Creative Commons. Original photo by Nick Barth.